There are easier ways to ascend la Grande Sure, but this route (map) provides a satisfying circuit and a superb little scramble onto the summit, as well as providing an excellent introduction to the area. The walk starts from les Trois Fontaines (780 m, grid ref. UTM 31T 70999 50227). This is approached from la Placette, a small village between Voreppe and St. Laurent-du-Pont. The road up to the car park is narrow, with the last kilometre being on a reasonably-surfaced forest track. From this road, one can see into the impressive cirque rising up behind les Trois Fontaines. A signposted track leads into the forest from the south end of the car park. This quickly turns into a good path which zig-zags its way up the steep slopes. Our route leaves the main path after half an hour on the left just after a zig-zag crossing of a forest slide. After climbing steadily through the forest for some twenty minutes the path ascends a steep slope almost directly by means of a series of rocky steps. The route is a little ambiguous in places, but as long as you keep out of the trees you should be all right. At the top the angle eases, and a positive path enters the trees and ascends a wooded ridge. There are a couple of bifurcations - but in both cases both branches rejoin. When the path divides in front of a rock wall it is better to keep right, and when the path ahead widens into a bit of a muddy sprawl, it is better to keep left. Forty minutes after reaching the ridge, a fence which marks the boundary of the alpine pastures below the impressive summit cliffs is crossed. The Cabane de Jusson soon comes into view. From the cabin, the summit cross may be seen crowning the western cliffs. Immediately below the cross is a prominent gully - this is our way to the top. The best way to reach this is to climb directly up towards it. You will soon meet a path, but do be careful about being led astray by sheep trods traversing the flanks. If in doubt, just make way your way straight up. The base of the cliffs is reached after some 30 minutes of steep ascent. There are a couple of gullies, but the correct one may be readily identified by the path entering it, and by a red and yellow arrow pointing into it. The path ascends the gully easily at first, but then comes to a 10 m high rock barrier. This is a steep but easy scramble (Difficulty 2) where a rope may engender confidence in the less experienced. Above this the path winds its way up the rest of the gully to join the crest barely 50 m from the small summit cross after a three hour ascent. As always, the views from the summit are superb, but one is also impressed by the size and complexity of the Grande Sure massif, and how isolated it is from its neighbours. 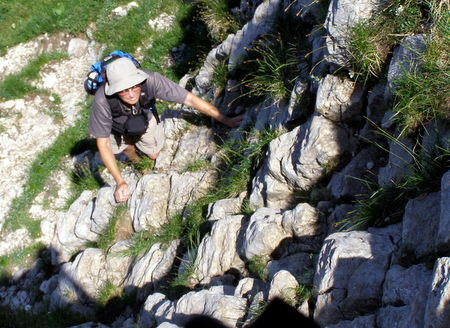 From the top, it is possible to make one's way down the south ridge, but it is far more pleasant to follow the main path into the internal valley below. This follows a line to the north at first, and then drops down towards the Col de la Sure (1675 m), which is one of the two major cols that divides the internal valley. Turning right at the col, another junction is reached after 50 m with our way being signposted les Trois Fontaines. This path makes its way down the central valley through dwarf pine and little ravines, until it reaches la Velouse (1500 m) - one of the main access routes into the valley, and where the route down the south ridge rejoins. Turning right through the fence leads to a stony track descending steeply. This relents after some ten minutes, and we shortly reach the Combe des Veaux junction, which is the start of an alternative route to the Cabane de Jusson. Fifteen easy minutes later, having passed a junction to the left, the views start to open up and the path morphs into the Pas de Miséricorde - one of the highlights of the day. This superbly made section of path follows a ledge system along the cliffs, and although there is some mild exposure (Difficuly 2), the path is so well made there is no objective danger, and it is equipped with a cable to reassure the nervous. It's airy, and it's great fun. A few minutes later a belvédère is reached, with a fine view across the cirque to a small thrust fault - it's a good place to sit and enjoy the view. After a further fifteen minutes we pass a junction where our ascent path is rejoined, and the car is reached twenty minutes later, some two hours after leaving the summit.